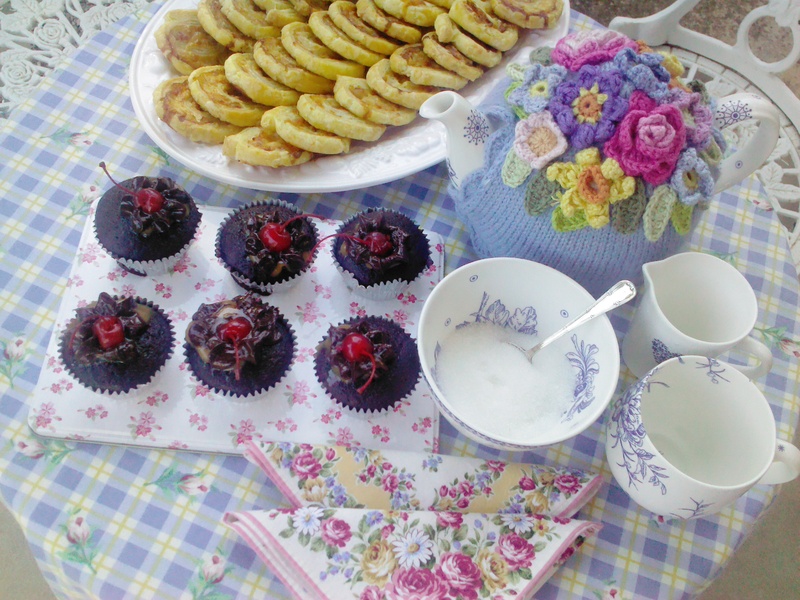 I belong to a quilt/craft group that meets every Thursday and each one of us gets a turn to make eats for morning tea! Well this week it was my turn to make some treats for tea. Here is my quick and easy bakes (other than the local home industry). My chocolate cupcakes and cheese bacon rolls are always a hit! 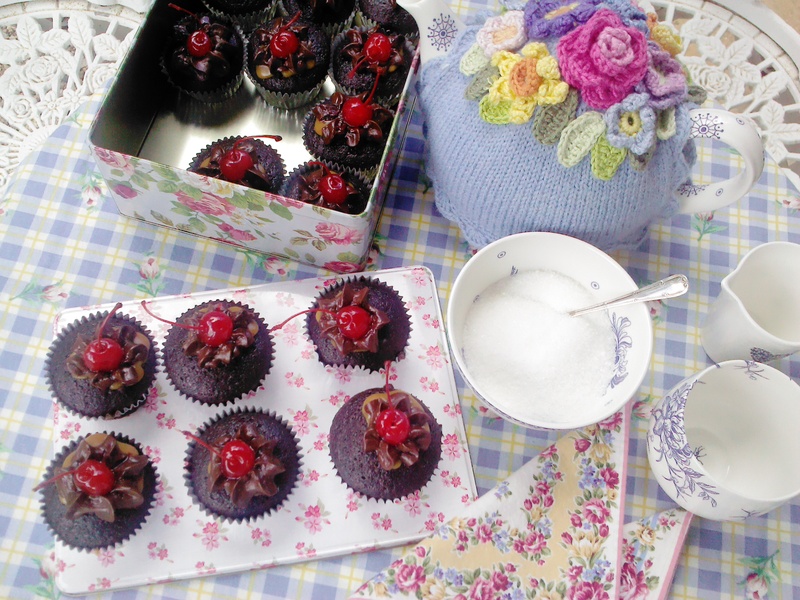 Bake 24 chocolate cupcakes in paper cups using your own favourite chocolate cupcake recipe. If you don’t have one here is mine using only 2 dishes, one large mixing bowl to sieve and mix the dry ingredients the other a 1 liter measuring jug to mix the wet ingredients. Pre heat oven to 180⁰C. Line 24 muffin tin hollows with paper cups. Sift all the dry ingredients together into the mixing bowl, making sure all the ingredients are mixed together, make a well in the centre. Now mix all the wet ingredients in the measuring jug and pour into the well. Mix well. At this point I pour the batter back into the measuring jug to fill the paper cups. Bake for 25min. Cool on rack. When the cupcakes have cooled down, hollow out a little of the centre, fill the hollowed out centre with the fudge spread or caramel condensed milk using a tea-spoon or a piping bag. Fill piping bag with the chocolate frosting or homemade chocolate icing, use a big star nozzle and pip big stars to cover the fudge/caramel filling. Decorate with a maraschino cherry. Eat the 25th cherry! Now for the savoury treat! This is so easy it only has 3 ingredients! Pre heat the oven to 180⁰C. Roll out, not with a rolling pin, just unroll the puff pastry, keep the plastic wrapping the pastry was rolled up in. Place the bacon length wise onto the pastry, leave about a ½” only of the bottom edge of the pastry free of filling (otherwise when you roll it up the filling peels out) , sprinkle the cheese over the top, roll up not to tight and not to loose, starting at the top working down the bottom edge. Wrap in the plastic wrapping and place in fridge over night or at least 2hours to firm up. Cut the roll in half with a very sharp knife, now cut each half into discs of about 10mm thick (20 – 26 discs), place on a baking sheet that has been sprayed with non stick food spray. Bake for 20 to 25min till golden brown. My tea turn fell on Valentine’s Day. This is my late moms birthday. I lost her suddenly 15 months ago. This entry was posted in Cooking, Recipes and tagged buzyday, cheese bacon rolls recipe, chocolate cupcake recipe, NikkiM. Bookmark the permalink. Did you knit this tea cosy? It’s one of the nicest I’ve seen. I’m finding myself pinning a lot of your photos this morning! Lovely blog Nikki, LOVELY. The table looks great with the sweet eaters in my house it would be gone in a flash, Lol I know how you feel I lost my mom 3 years ago her birthday is still hard to deal with, but your table looks like a nice to way to make it though. I will have to try it on her next birthday.